We offer a wealth of experience regarding many leading brand name boilers. Our engineers attend regular courses to keep updated with all new appliances for your comfort and safety. We can undertake any heating or servicing task, large or small, as well as offering you piece of mind that you will receive a prompt and economical job. After discussing your needs with you we will find the boiler which is the most efficient for your own family environment. A quote will be given, and work can start at a convenient time for you, which will cause little or no inconvenience to yourselves. When complete we will issue a full guarantee. We can also advise you on your full central heating system, including radiators, control equipment and pumps. 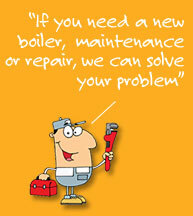 Boiler manufacturers will recommend you have a regular service, usually annually. We charge a standard rate for a service wherever you are. Having this done regularly will, in the long run, save you time and money. You can rely on us to be thorough and efficient and will always clear the site up completely before we leave, so not to inconvenience you. Book a service with Calypso and we will advise you when your next annual service is due. We strongly advise that a carbon monoxide alarm is fitted in every home with a boiler which we can install free of charge. See the Health And Safety Executives gas safety awareness website for more details. One phone call to our office will give you the peace of mind that we can promptly arrange an appointment to deal with your problem. If we cannot fix it immediately, you can be guaranteed that should a part have to be ordered, priority will be given to replace as soon as possible.